Middle class to reach 41% of population by 2025. Consumption expenditure to be 3.6 trillion USD by 2020. 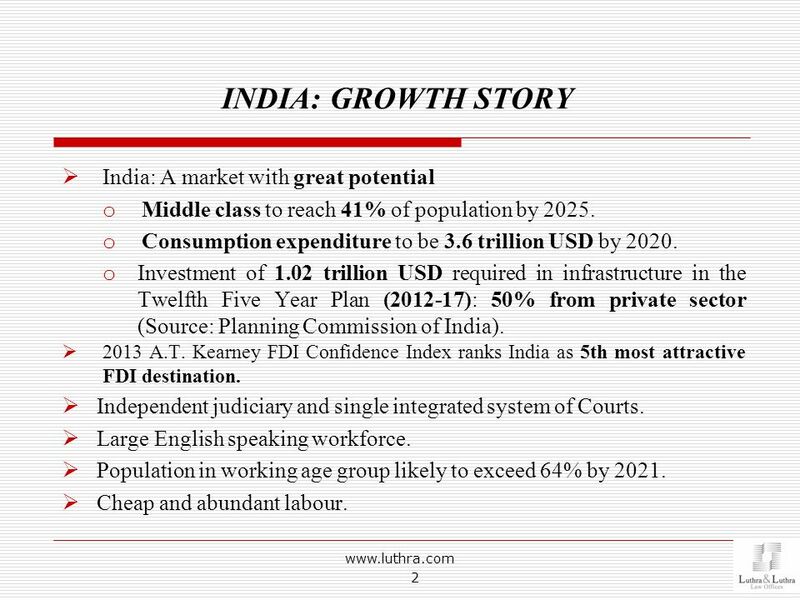 Investment of 1.02 trillion USD required in infrastructure in the Twelfth Five Year Plan ( ): 50% from private sector (Source: Planning Commission of India). 2013 A.T. Kearney FDI Confidence Index ranks India as 5th most attractive FDI destination. Independent judiciary and single integrated system of Courts. Large English speaking workforce. Population in working age group likely to exceed 64% by 2021. Cheap and abundant labour. Policy paralysis and procedural delays: Projects not implemented example, Posco and ArcelorMittal’s Odisha steel project. Rise in bad loans/NPA in the banking sector: Inability of companies to pay back debts due to delays in implementation of projects and consequent returns. 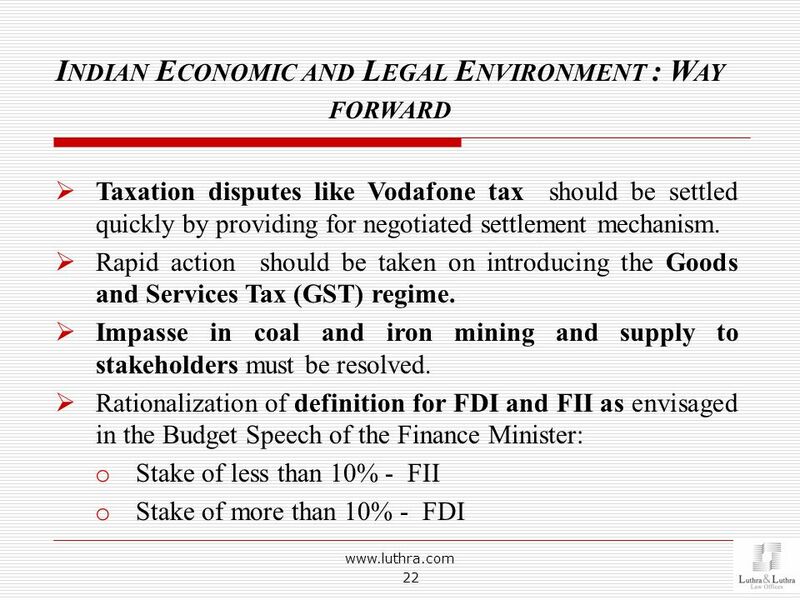 Uncertainty in Tax laws Vodafone controversy: Retrospective amendment in tax law by the Government. Transfer pricing issues: Shell India case – Issue of shares by Shell India to its two parent companies subject to transfer pricing rules; Vodafone India Services case – sale of call centre business to Hutchison Whampoa Properties subject to transfer pricing rules. 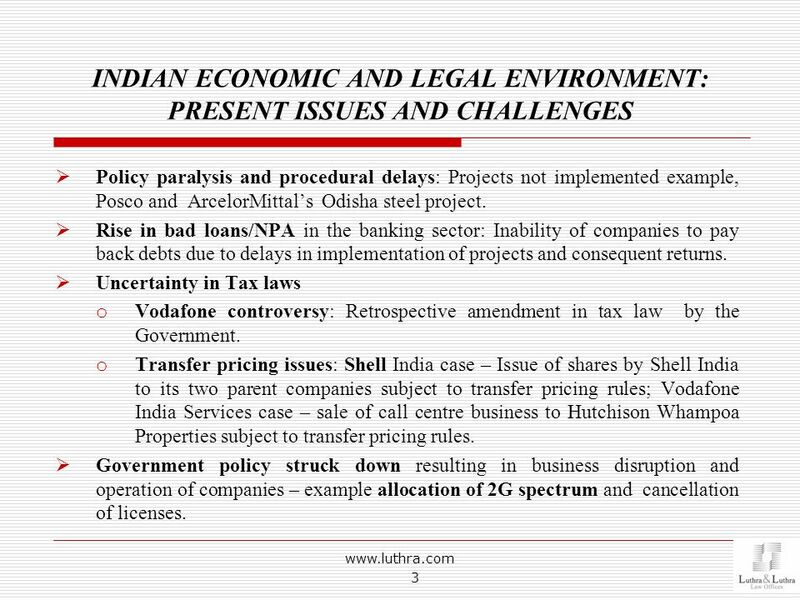 Government policy struck down resulting in business disruption and operation of companies – example allocation of 2G spectrum and cancellation of licenses. Mon, Aug Mumbai: The Bombay high court on Monday asked the income-tax (I-T) department to respond to arguments by the Indian units of Vodafone Group Plc and Royal Dutch Shell Plc against alleged transfer pricing. Both the firms have challenged tax demands through writ petitions in the high court, which have been bunched together as both relate to transfer pricing. Transfer pricing is the practice of arm’s length pricing for transactions between group companies based in different countries to ensure that a fair price—one that would have been charged to an unrelated party—is levied. Vodafone challenged a transfer-pricing order over the issue of shares by its unit Vodafone India Services Pvt. Ltd. Shell India is fighting a tax order accusing it of underpricing an intra-group share transfer by Rs.15,000 crore and consequently evading taxes. On Monday, lawyer Harish Salve, who represented both Vodafone and Shell India, argued that the orders passed by the tax department are incorrect as no income arose out of the transactions, which have been taxed. The high court asked the tax department to file a reply in both the cases. It will hear the matter again on 30 September. Companies such as Vodafone, Shell India and Microsoft India have recently come under the tax department’s scanner for transfer pricing-related issues. Many are exploring legal options. India has seen a sharp increase in disputes relating to transfer pricing, with the tax department adopting an aggressive stand while arriving at a price for such transactions. The transfer-pricing assessment by the tax department for the year ended March 2008 saw the government raising claims to the tune of $9.5 billion. The Vodafone and Shell cases are a fallout of retrospective amendments introduced in the national budget of 2012 that included capital financing under the transfer-pricing net, analysts say. With multinational companies looking to expand business in India, the issue of arm’s length pricing has come under increased scrutiny of the transfer pricing wing of the I-T department. It comes at a time when the government is struggling to meet its fiscal deficit targets due to slowing revenue collection, especially on corporate taxes. Vodafone, the largest corporate investor in India, has repeatedly clashed with Indian authorities over taxes since it bought Hutchison Whampoa Ltd’s local mobile business in 2007. Vodafone and Shell India have also challenged these orders before the dispute resolution panel of the Indian I-T department. 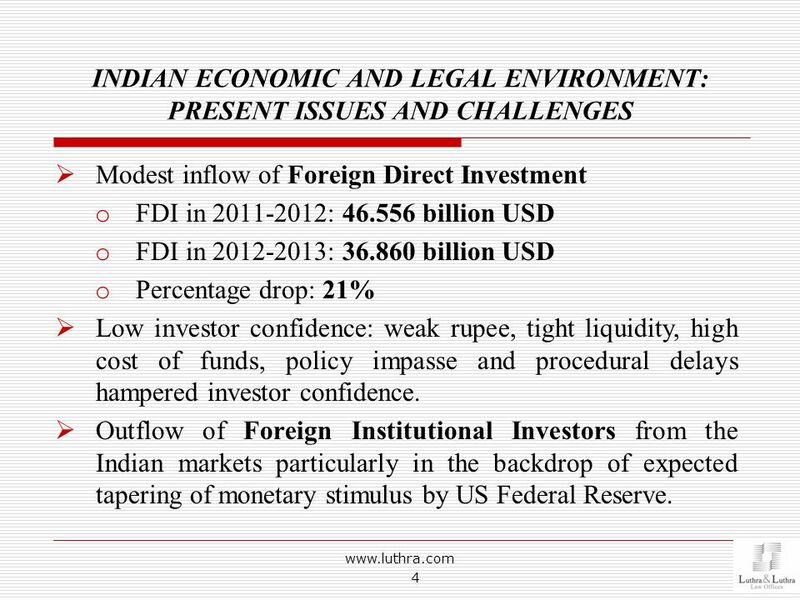 Modest inflow of Foreign Direct Investment FDI in : billion USD FDI in : billion USD Percentage drop: 21% Low investor confidence: weak rupee, tight liquidity, high cost of funds, policy impasse and procedural delays hampered investor confidence. Outflow of Foreign Institutional Investors from the Indian markets particularly in the backdrop of expected tapering of monetary stimulus by US Federal Reserve. CORRECTIVE MEASURES AND INITIATIVES Key Recent Changes in Foreign Direct Investment Policy The Government recently liberalized sectoral entry norms and limits in various sectors. Increase in FDI inflow in India FDI for the period for the period January-June 2013 period billion USD FDI for the period January-June 2012 period billion USD Percentage rise: 6% Single Brand Retail Trading: FDI up to 49% now allowed under the Automatic route Beyond 49 % under the Approval route, up to 100%. Multi Brand Retail Trading: Earlier, FDI was prohibited. In 2012, FDI up to 51% allowed under the Approval Route. Certain onerous conditions had been imposed on foreign investors. These conditions have been diluted by the Government to attract more investors to the sector. 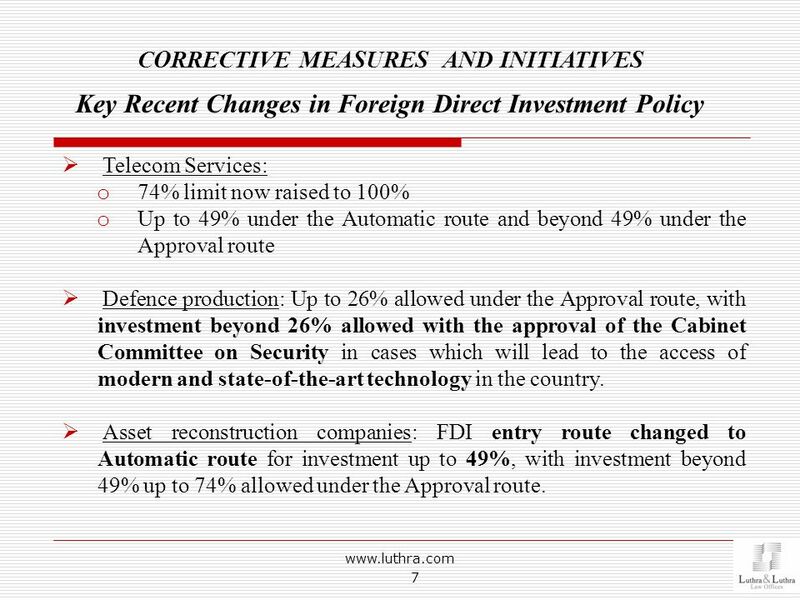 CORRECTIVE MEASURES AND INITIATIVES Key Recent Changes in Foreign Direct Investment Policy Telecom Services: 74% limit now raised to 100% Up to 49% under the Automatic route and beyond 49% under the Approval route Defence production: Up to 26% allowed under the Approval route, with investment beyond 26% allowed with the approval of the Cabinet Committee on Security in cases which will lead to the access of modern and state-of-the-art technology in the country. Asset reconstruction companies: FDI entry route changed to Automatic route for investment up to 49%, with investment beyond 49% up to 74% allowed under the Approval route. 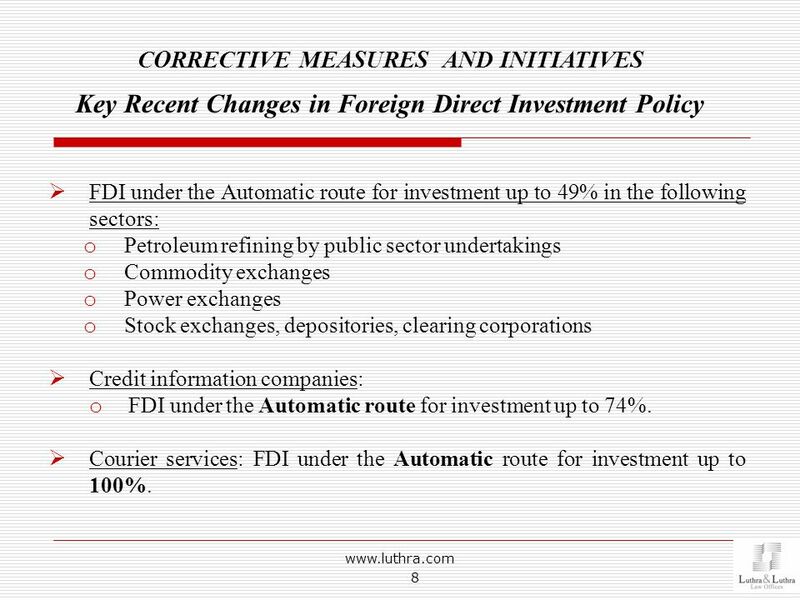 CORRECTIVE MEASURES AND INITIATIVES Key Recent Changes in Foreign Direct Investment Policy FDI under the Automatic route for investment up to 49% in the following sectors: Petroleum refining by public sector undertakings Commodity exchanges Power exchanges Stock exchanges, depositories, clearing corporations Credit information companies: FDI under the Automatic route for investment up to 74%. Courier services: FDI under the Automatic route for investment up to 100%. 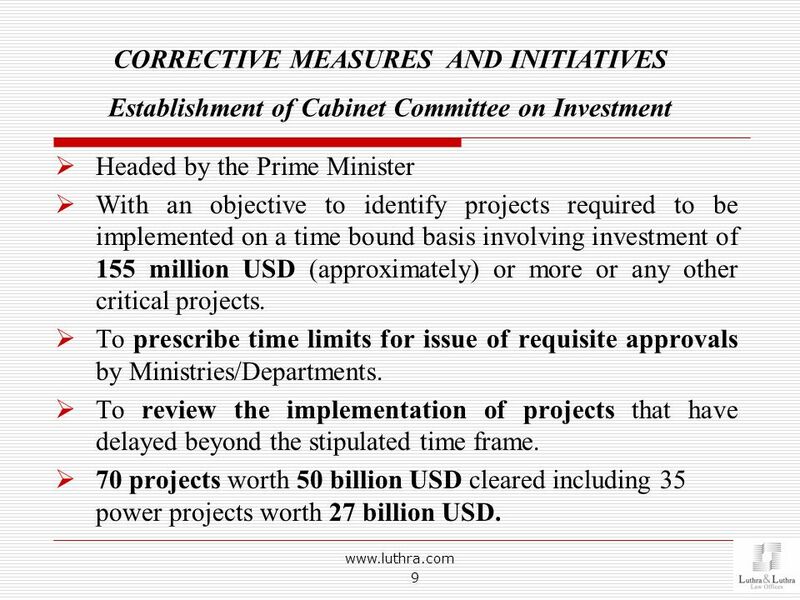 Establishment of Cabinet Committee on Investment Headed by the Prime Minister With an objective to identify projects required to be implemented on a time bound basis involving investment of 155 million USD (approximately) or more or any other critical projects. To prescribe time limits for issue of requisite approvals by Ministries/Departments. To review the implementation of projects that have delayed beyond the stipulated time frame. 70 projects worth 50 billion USD cleared including 35 power projects worth 27 billion USD. 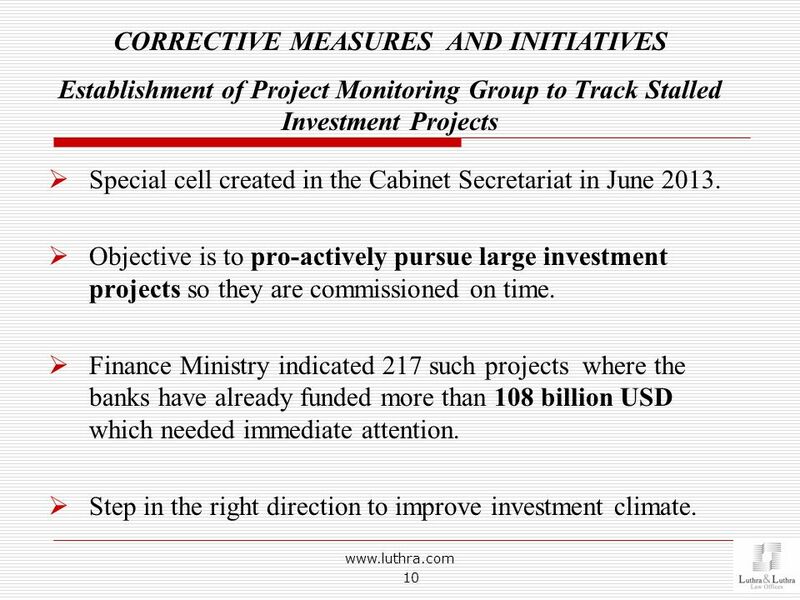 Establishment of Project Monitoring Group to Track Stalled Investment Projects Special cell created in the Cabinet Secretariat in June 2013. Objective is to pro-actively pursue large investment projects so they are commissioned on time. Finance Ministry indicated 217 such projects where the banks have already funded more than 108 billion USD which needed immediate attention. Step in the right direction to improve investment climate. 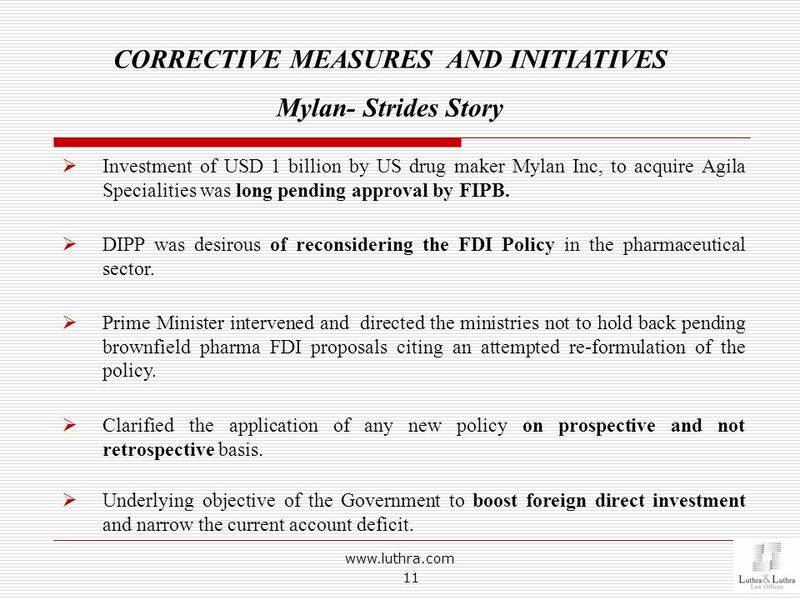 Mylan- Strides Story Investment of USD 1 billion by US drug maker Mylan Inc, to acquire Agila Specialities was long pending approval by FIPB. DIPP was desirous of reconsidering the FDI Policy in the pharmaceutical sector. Prime Minister intervened and directed the ministries not to hold back pending brownfield pharma FDI proposals citing an attempted re-formulation of the policy. Clarified the application of any new policy on prospective and not retrospective basis. 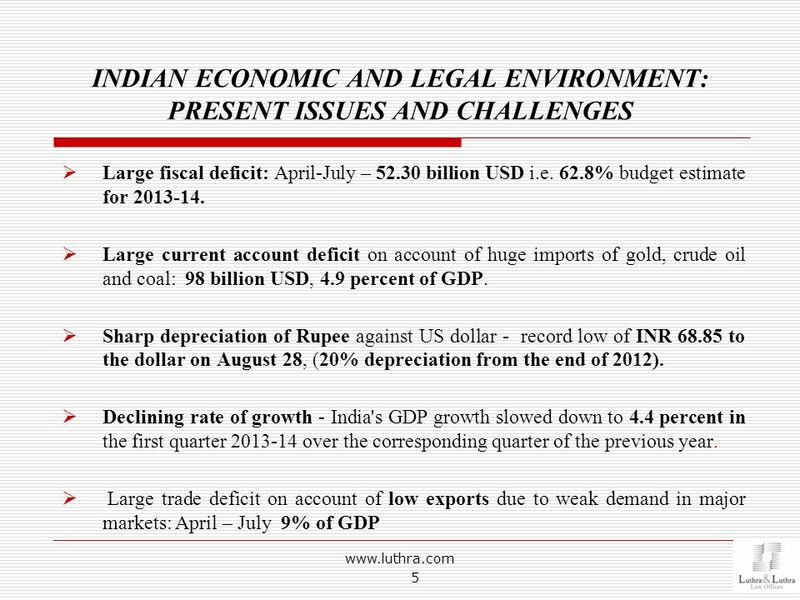 Underlying objective of the Government to boost foreign direct investment and narrow the current account deficit. Up to 100 per cent FDI was earlier allowed through the automatic route in the pharma sector. In November last year, the government had made FDI in existing pharma companies stricter by putting it under FIPB scrutiny and moving it out of the automatic approval route. It was also made mandatory that such proposals would have to seek clearance from the Competition Commission of India (CCI). Jet-Etihad Deal Foreign airlines were not permitted to pick up stake in Indian carriers. Policy was liberalized in 2012 for foreign airlines to invest upto 49% stake. Abu Dhabi's Etihad Airways acquisition of 24% stake in Jet Airways recently cleared by FIPB. 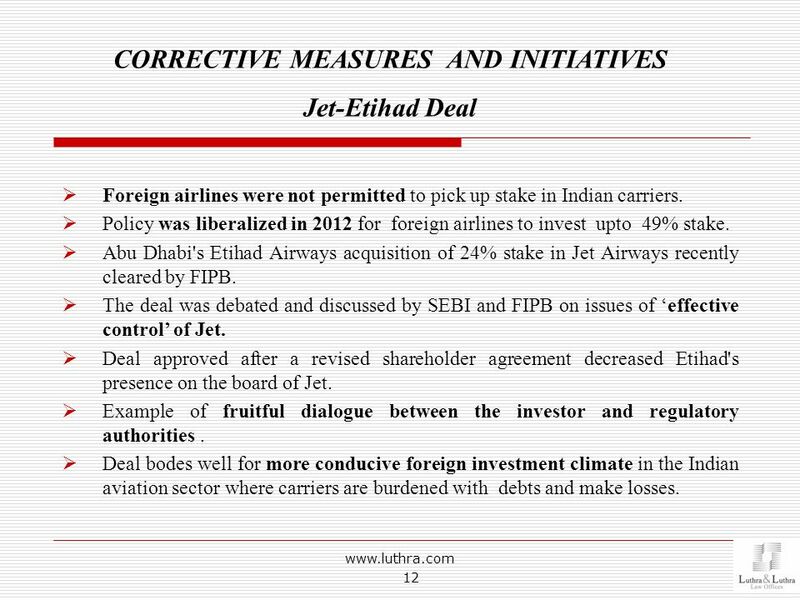 The deal was debated and discussed by SEBI and FIPB on issues of ‘effective control’ of Jet. Deal approved after a revised shareholder agreement decreased Etihad's presence on the board of Jet. Example of fruitful dialogue between the investor and regulatory authorities . Deal bodes well for more conducive foreign investment climate in the Indian aviation sector where carriers are burdened with debts and make losses. 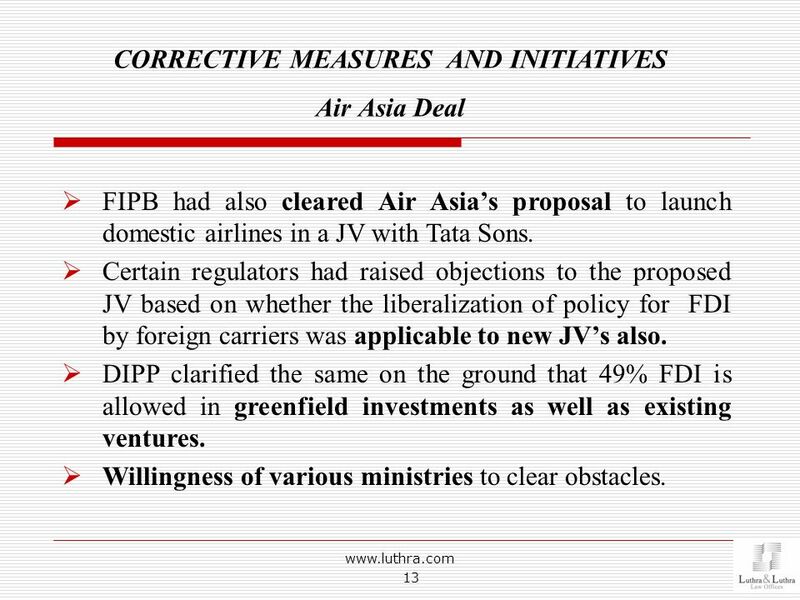 Air Asia Deal FIPB had also cleared Air Asia’s proposal to launch domestic airlines in a JV with Tata Sons. Certain regulators had raised objections to the proposed JV based on whether the liberalization of policy for FDI by foreign carriers was applicable to new JV’s also. DIPP clarified the same on the ground that 49% FDI is allowed in greenfield investments as well as existing ventures. Willingness of various ministries to clear obstacles. 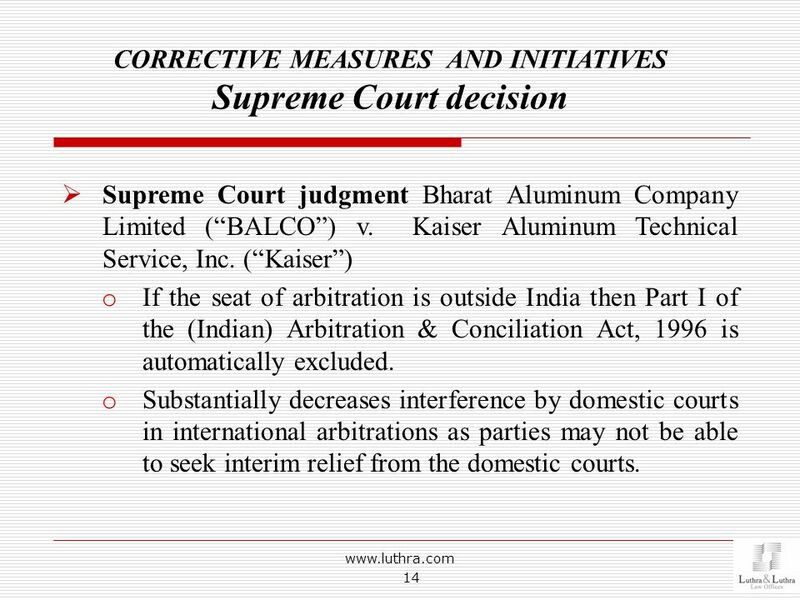 Supreme Court judgment Bharat Aluminum Company Limited (“BALCO”) v. Kaiser Aluminum Technical Service, Inc. (“Kaiser”) If the seat of arbitration is outside India then Part I of the (Indian) Arbitration & Conciliation Act, 1996 is automatically excluded. Substantially decreases interference by domestic courts in international arbitrations as parties may not be able to seek interim relief from the domestic courts. 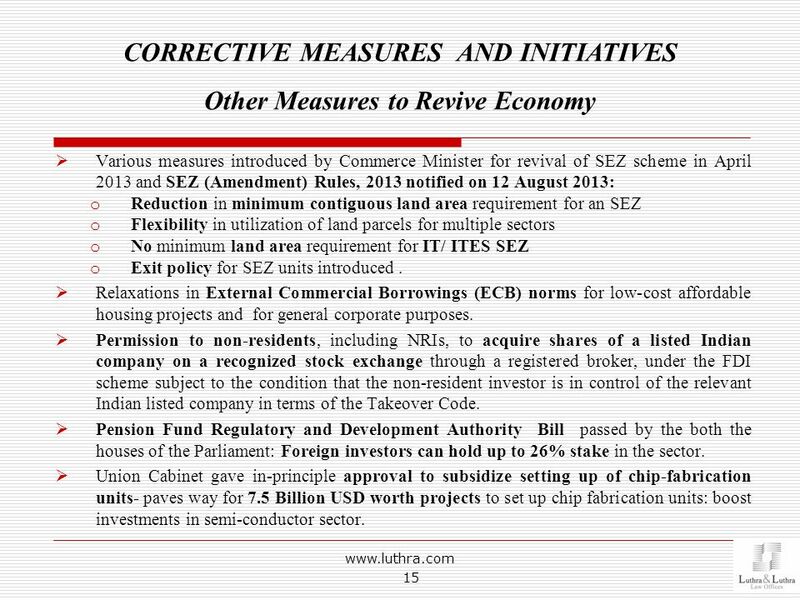 Various measures introduced by Commerce Minister for revival of SEZ scheme in April 2013 and SEZ (Amendment) Rules, 2013 notified on 12 August 2013: Reduction in minimum contiguous land area requirement for an SEZ Flexibility in utilization of land parcels for multiple sectors No minimum land area requirement for IT/ ITES SEZ Exit policy for SEZ units introduced . Relaxations in External Commercial Borrowings (ECB) norms for low-cost affordable housing projects and for general corporate purposes. Permission to non-residents, including NRIs, to acquire shares of a listed Indian company on a recognized stock exchange through a registered broker, under the FDI scheme subject to the condition that the non-resident investor is in control of the relevant Indian listed company in terms of the Takeover Code. Pension Fund Regulatory and Development Authority Bill passed by the both the houses of the Parliament: Foreign investors can hold up to 26% stake in the sector. Union Cabinet gave in-principle approval to subsidize setting up of chip-fabrication units- paves way for 7.5 Billion USD worth projects to set up chip fabrication units: boost investments in semi-conductor sector. Companies Act, 2013 which seeks to replace the six-decade old Companies Act, 1956 received Presidential assent on August 29, 2013. Maximum number of members in a private company increased from 50 to 200. Introduction of concept of One Person Company. For infrastructural projects, preference shares can now be issued for a period exceeding 20 years. Consolidation of financial statements now made mandatory. Erstwhile mandatory requirement for transfer of profits to reserves for dividend declaration to be done away with. Rotation of Auditors made mandatory. 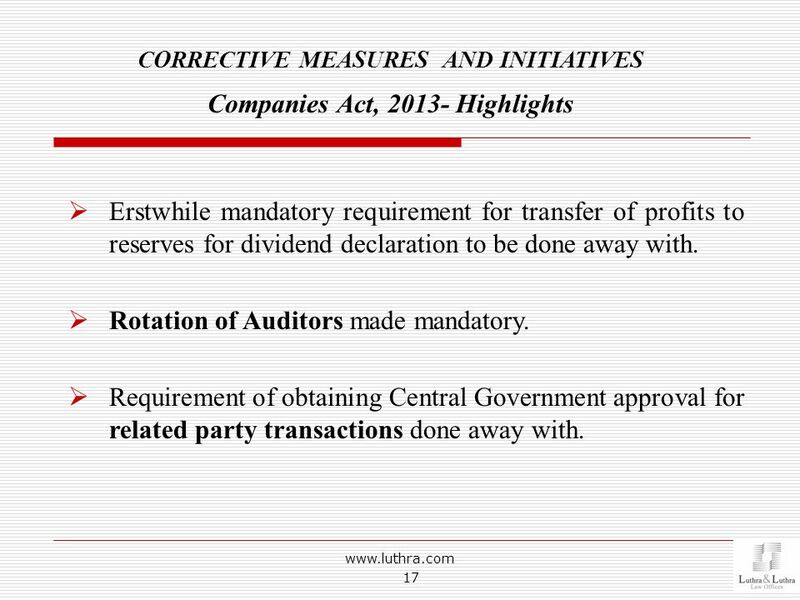 Requirement of obtaining Central Government approval for related party transactions done away with. Independent Directors not liable to retire by rotation. Inability to pay debts to be considered as criteria for determining a sick company. 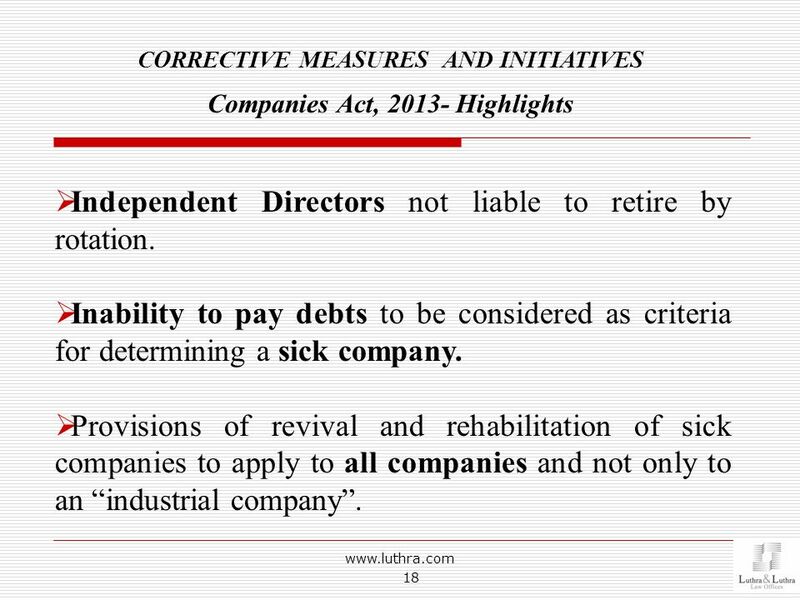 Provisions of revival and rehabilitation of sick companies to apply to all companies and not only to an “industrial company”. Indian company can be merged with a foreign company Fast track merger for small companies and holding wholly-owned subsidiaries introduced. Person/ group of persons holding 90% or more equity shares by virtue of amalgamation etc. can purchase the remaining equity shares of the company from minority shareholders. To facilitate transition to new regime, central government empowered to remove difficulties up to 5 years from commencement of Companies Act, 2013. The companies Act 2013 specifies that in cases where 90 percent or more of the equity shareholding in a company is acquired by any person or group of persons, such a group is obliged to make an offer to buy out shares held by minority shareholders as well. The price at which the shares have to be sold will be pre-determined on the basis of valuation by a ‘registered valuation expert’. The process of valuation and purchase of shares will have to be done in accordance with the rules prescribed by the government. 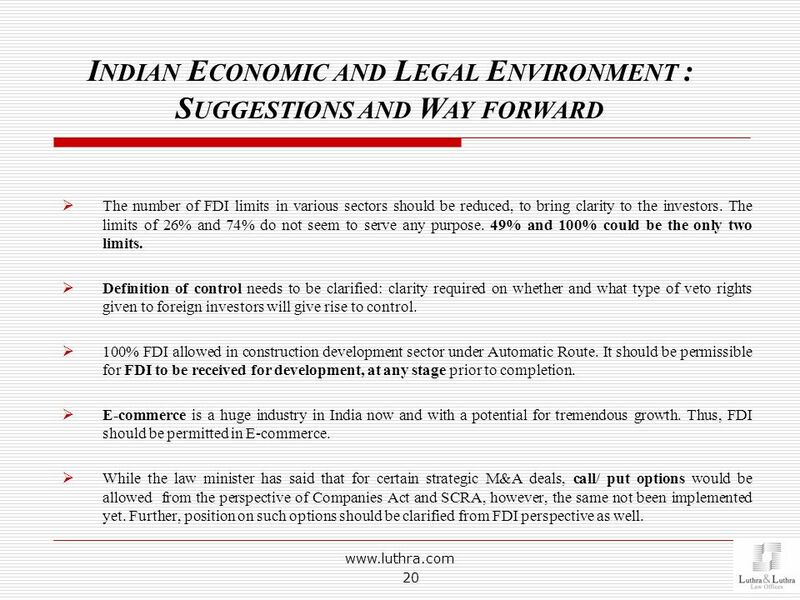 The number of FDI limits in various sectors should be reduced, to bring clarity to the investors. The limits of 26% and 74% do not seem to serve any purpose. 49% and 100% could be the only two limits. Definition of control needs to be clarified: clarity required on whether and what type of veto rights given to foreign investors will give rise to control. 100% FDI allowed in construction development sector under Automatic Route. It should be permissible for FDI to be received for development, at any stage prior to completion. E-commerce is a huge industry in India now and with a potential for tremendous growth. Thus, FDI should be permitted in E-commerce. While the law minister has said that for certain strategic M&A deals, call/ put options would be allowed from the perspective of Companies Act and SCRA, however, the same not been implemented yet. Further, position on such options should be clarified from FDI perspective as well. Fast tracking the implementation of stalled projects: Procedural issues be adequately addressed Inter-ministerial coordination and coordination with the states ensured. 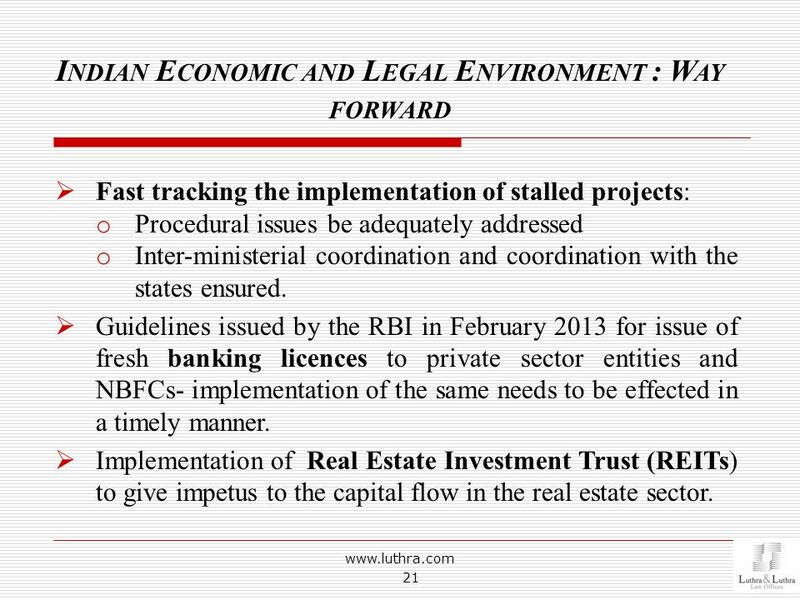 Guidelines issued by the RBI in February 2013 for issue of fresh banking licences to private sector entities and NBFCs- implementation of the same needs to be effected in a timely manner. Implementation of Real Estate Investment Trust (REITs) to give impetus to the capital flow in the real estate sector. 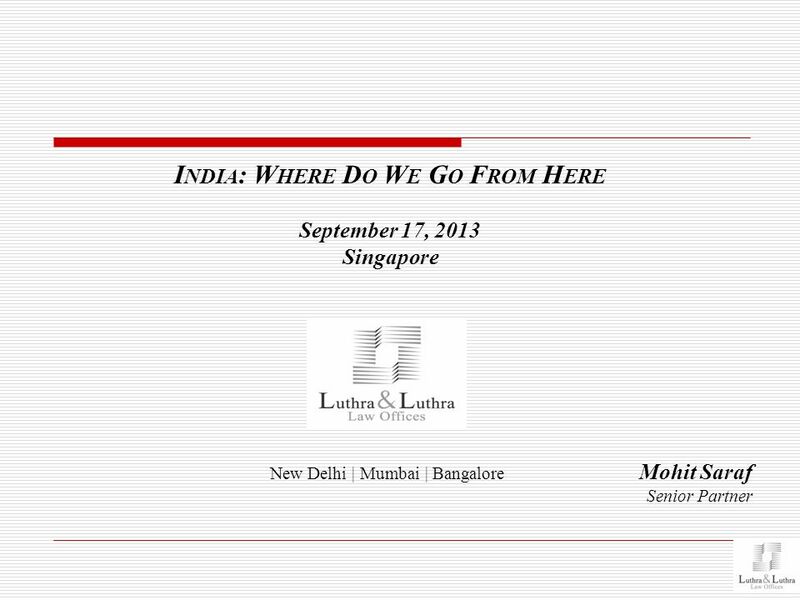 Download ppt "India: Where Do We Go From Here"
12 March 2009 Foreign Investment Policy in India: Recent Guidelines. Chapter 11 An Introduction to Open Economy Macroeconomics. Master Circular dated July 01, 2011 issued by RBI vis-à-vis Consolidated FDI Policy Circular 1 of 2011 dated March 31, 2011 Master Circular – Foreign Direct. Financing Essentials for Public-Private Partnerships United Nations SU/SSC Training Course September 19, 2006. 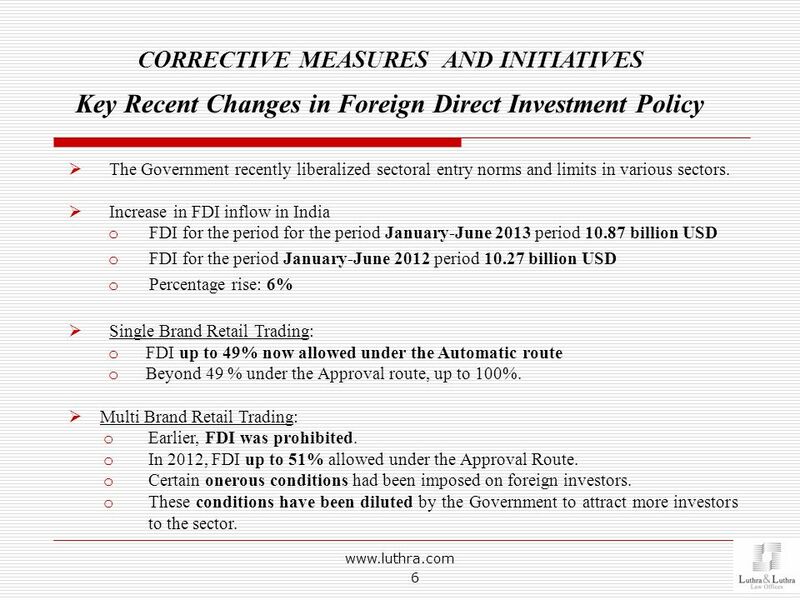 FOREIGN DIRECT INVESTMENT (FDI)- POLICY CHANGES September Preliminary & tentative – Not for circulation For discussions only. Copyright © 2009 Pearson Prentice Hall. All rights reserved. Chapter 8 Capital Budgeting Cash Flows. 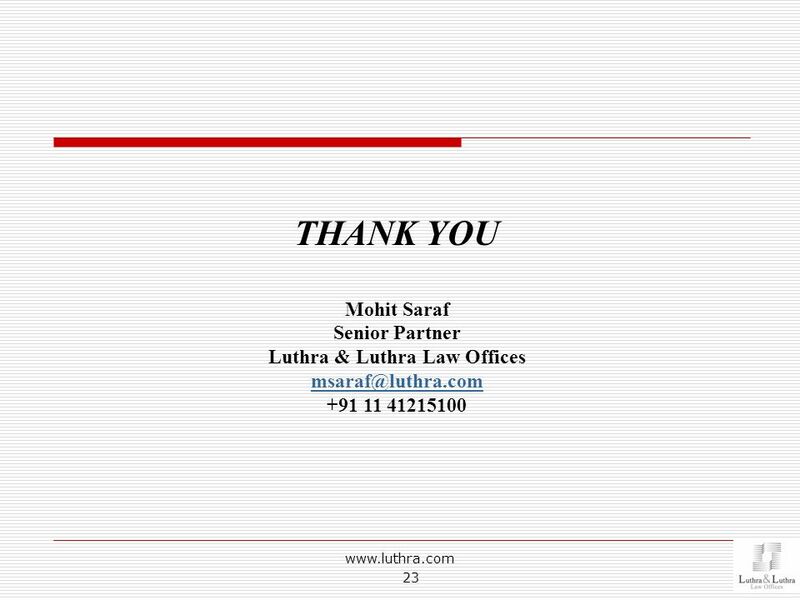 Loans/Investments, Acceptance of Deposits & SFIO - under Companies Act, 2013 CA Jayant Thakur 27th April 2014, WIRC, ICAI. Turkish Economy “Recent developments” Ekrem Keskin November 2008. Trends & Outlook in ECBs D. R. Dogra CARE RATINGS.